The key with spreading cookie dough, whether as a base or on top, is to create an even layer. A few tips can save time and mess! Do you spread or press? That depends on the cookie dough consistency. A batter-like dough (as in many brownie recipes) is simple to spread because you practically pour it into the pan. But thicker dough must be pressed and can be trickier to make an even layer. To spread batter-like dough, pour it into the pan, scraping sides of the mixing bowl to get it all. Use a kitchen knife or a spatula to spread the dough. One of my favorite baking tools is an angled spatula. The angle allows the spatula’s surface to lay flat on the dough surface for a smoother spread. Spread batter-dough back and forth from one side of the pan to the other so it is evenly distributed. Set the baking pan on a flat surface, such as a glass-topped stove or a kitchen counter. Slide the pan back and forth several times to allow the batter-dough to settle evenly. Let the batter-dough settle in the baking pan for a minute or two before placing it in the oven. To prevent cookie dough from sticking to your hands, moisten your fingers with water or spray your fingertips with vegetable spray. Drop dollops of dough into the bottom of the pan. Use your fingertips or the heel of your hand to press the cookie dough into the bottom of the pan. Be sure to press dough into corners. Use an angled spatula to press out lumps and level the pressed cookie layer. To make the most even surface, lay a piece of waxed paper across the pressed dough. Use a loaf pan or square box of butter to press down and smooth the top layer. Peel away waxed paper. Spreading dough into the bottom of a pan is not difficult, since you can press against the pan’s lower surface. 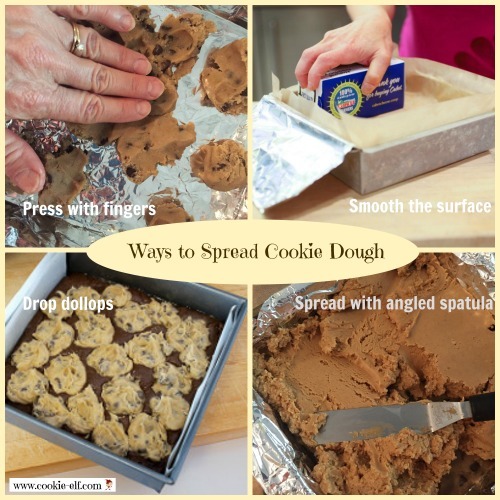 But certain cookie recipes (like Chocolate Chip-Peanut Butter Squares or Can’t Leave Alone Bars) call for you to spread prepared cookie dough over a filling – another matter altogether. You don't want to create a gloppy mess when you try to spread the dough. Nor do you want the filling does not ooze out and creep up over onto the top of the cookies. How can you make sure the topping leaves a neat, tidy surface? Flour your fingers … or moisten them, if the dough is particularly sticky. If cookie dough is stiff or dry in texture, then crumble it into as many small pieces as possible and then sprinkle dough pieces over the cookie filling surface. If cookie dough is thick in texture, then pinch off a teaspoon or two at a time. Flatten each chunk of dough and lay each one individually across the cookie filling surface so they are nearly touching each other. Get more Baking Cookies How-Tos on our Pinterest board.